The Celtics are the most storied franchise in NBA history with 17 championships and 22 retired numbers since their inception in 1946. During their 73-year existence, no other player has stopped by for just two and half seasons and made a timeless impact the way Isaiah Thomas did from 2015 to 2017. IT was acquired at the 2015 trade deadline in exchange for Marcus Thornton and a 2016 first-round pick. He proceeded to lead a 20-31 team to a 20-11 record the rest of the way, resulting in an improbable playoff berth. In 2015-16 he made his first All-Star Game and led the C’s to their best winning percentage since the last year of the Big Three in the strike-shortened 2011-12 season. They lost to the Hawks in the first round in six games, but Thomas’ 42 points in Game 3 were the most by a Celtic in a playoff win since Paul Pierce had 46 against the Sixers in 2002. More importantly, it showed us that he had heart to match his talent. Isaiah’s 2016-17 campaign was one of the most impressive scoring displays of all-time as we watched a 5’9” point guard average nearly 30 points a game (28.9). In the previous two seasons, he showed us how his next-level quickness could make him nearly unguardable. Then the addition of another All-Star in Al Horford gave him just enough freedom to rip defenses to shreds. The former last pick of the NBA Draft finished fifth in the MVP voting, ahead of Steph Curry, Giannis Antetokounmpo, John Wall, Anthony Davis, and Kevin Durant. The only guys ahead of him were Russell Westbrook, James Harden, Kawhi Leonard, and LeBron James. Wilt Chamberlain holds the NBA record for the most points in a fourth quarter. He racked up 31 to close out his famous 100-point game. The second most is 29, and that mark belongs to Isaiah Thomas in a win against the Heat on December 30th, 2016. IT finished that contest with 52, the most by a Celtic since Larry Bird’s franchise-record 60 against the Hawks in 1985. Isaiah topped that performance in the Eastern Conference Semifinals by pouring in 53 against the Wizards in Game 2. The second most by a Celtic in the playoffs behind John Havlicek’s 54 in 1973, and the highest playoff total in the NBA since Allen Iverson 14 years prior. Above all else it was his sister Chyna’s birthday, just days after she was tragically killed in a car accident. Unlike his height, the heart of Isaiah Thomas can’t be measured. His ability combined with his mental makeup made him everything that a Celtics fan looks for. Despite the incredible numbers, he fully recognized that he was a part of something much bigger than himself. He was just proud that he could contribute to a winning culture. Kyrie Irving’s all-around talent exceeds Isaiah’s. That’s not up for debate. When you factor IT’s hip injury and the fact that Kyrie is four years younger, it’s impossible to argue the trade. Irving is currently a top 10 player in the league and Thomas isn’t even seeing the floor. With that being said, go ahead and ask any Celtics fan which player is more likable. Kyrie still has a golden opportunity to endear himself to Boston, but as of right now his leadership and loyalty are in question while Isaiah continues to bleed green. IT even wore green shoes to the Garden as a member of the opposing team, later revealing that those kicks were intended to be worn in the 2017 NBA Finals if the Celtics had been able to get past the Cavs. 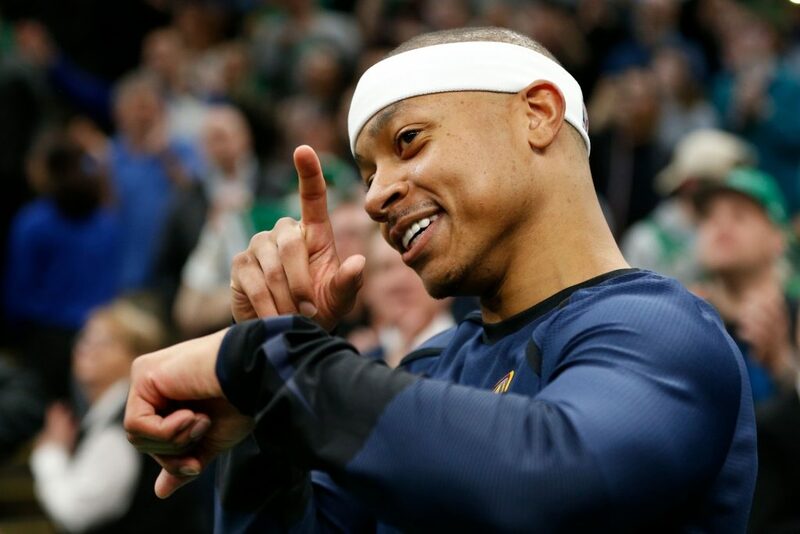 Isaiah is getting ready to hit free agency this summer and he’s hinted at a return to Boston. He’s 30 years old and is apparently becoming increasingly confident in his health. If his optimism proves to be justified then he could still be an effective scorer off the bench for a championship contender. It might be time to come home. Previous Are The Celtics Finally Finding Their Identity?